Drummers are the best musicians to photograph because they don't bounce around all over the place like singers and guitar players do (except maybe Keith Moon). And they're surrounded by all sorts of weird light enhancing stuff. You can get pictures with cool drumstick blurs and colored lights bouncing off cymbals. 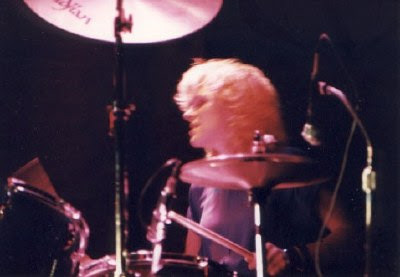 This picture is of Wednesday Week drummer, Kelly Callan, who today runs a cool record label called Avebury Records. I took the picture with my trusty Pentax ME Super at Club Lingerie in Los Angeles in 1987. No flash was used, just whatever light was bouncing off the cymbals.